Is it ok to wear white jeans after Labour Day? Hell ya! Even though the weather will be getting cooler soon, you can continue to wear some of your favourite summer items. I’ve put together photos for a little inspiration, for how you can style your summer favourites with items you most likely already own in your wardrobe. 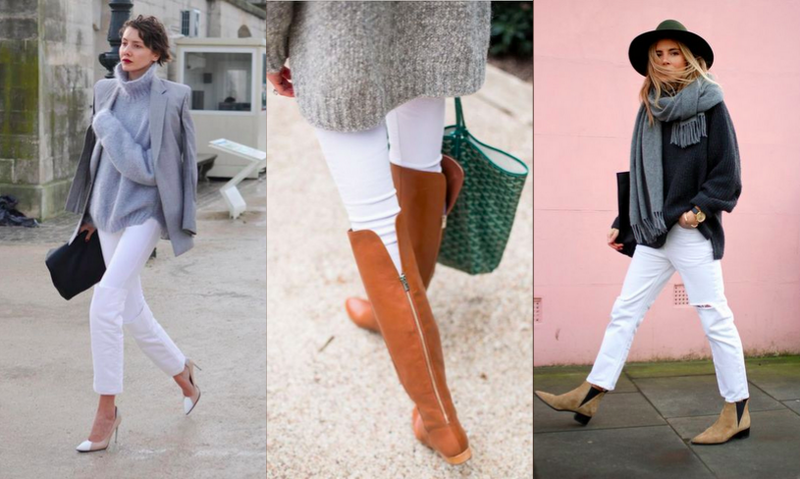 The last couple of years, fashionistas have been wearing white jeans year round. How to do that without looking inappropriate or out of season? Let the outfits below inspire you. As a general style rule, light colours look best worn on top with darker colours worn on the bottom. That theory is clearly shot here, as each of these outfits manage to break that rule and look amazing. The key is keeping the outfits neutral. Try wearing your white jeans with a loose blazer and oversized sweater with heels for a polished look, a long sweater and over-the-knee boots on the weekend, or style your white jeans with an oversized sweater, wide brim hat and ankle boot. Wearing a sheer maxi skirt in autumn with cosy separates and fall accessories? You bet! 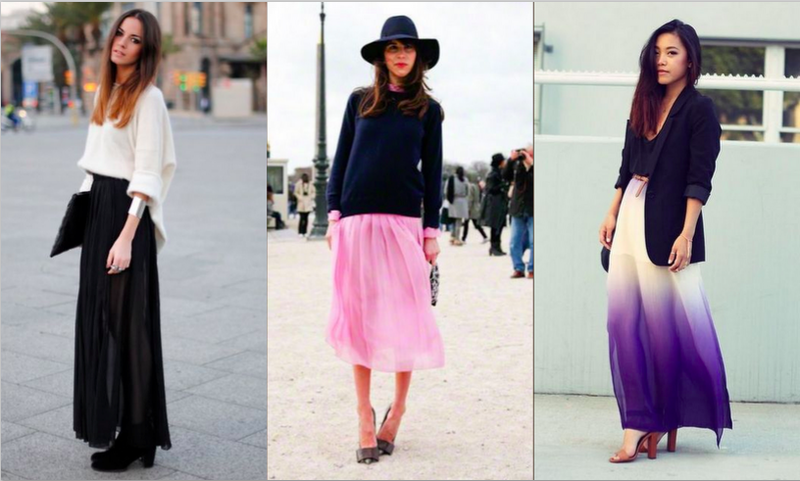 These three chic outfits above have inspired me to try wearing my sheer maxi skirt this autumn. Follow the lead to transition your sheer skirt into colder temperatures. The outfit on the left, so simple, so stylish, black & white is a classic combo and always looks right. The the sheer skirt is balanced with the sweater, by wearing suede ankle boots in the same colour as the skirt. Bonus, keeping a long uninterrupted column of black is slimming and helps you appear taller. I love the unexpected combination of the second image, with navy and pink, dark on top, light on the bottom. The basic navy pullover, looks hip worn with the wide-brimmed felt hat in the same colour. Finally, breakout your boyfriend blazer from the back of your wardrobe to achieve the look on the right. Long live the Canadian tuxedo! 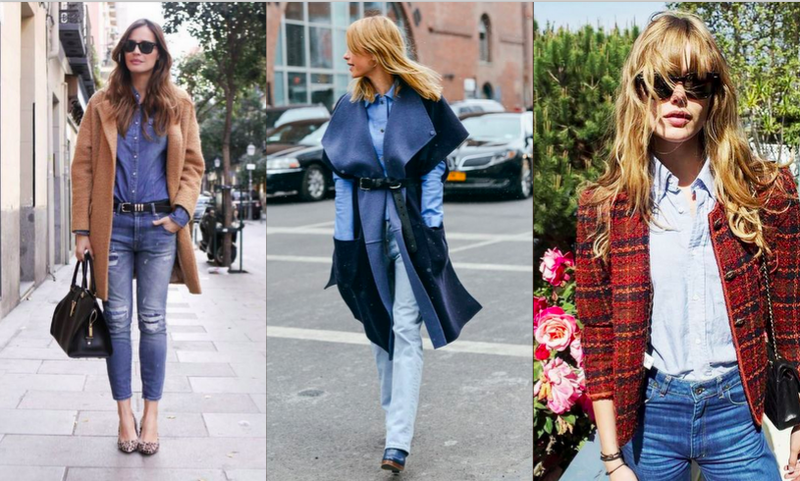 Double-denim still reins strong this fall as seen in the examples above. Take your’s to the next level, with one of fall’s new trend pieces. Accessorize your double-denim with a camel coat, belt, heels, and a structured bag for a pulled together yet casual ensemble. The middle outfit ups the ante on monochromatic dressing in super blue. The basic denim uniform is transformed into a stylish fashion forward look with a gorgeous blue blanket cape, belted and worn with blue boots. The cropped plaid blazer and chain-strap bag adds sophistication to the double-denim look far right. Although I’ve never considered wearing a white dress into fall, seeing these outfits above have changed my mind. Turns out the LWD is going to get more mileage this year worn with an “of the moment” jacket. Always fashionable, the trench coat looks perfect worn with the white dress shown left. If you don’t already own one, purchasing a good quality trench is a sound investment. As the centre look reveals, the biker jacket is here to stay. Wearing black opaque hose and black ankle boots, visually balances the weight of the heavy biker jacket. I’ll be wearing my LWD this fall like the look on the right. I’ve had the same H&M army jacket for 10 years and counting, talk about a good investment! Missing items in your wardrobe to create one of these fantastic outfits? Click on the photos below to shop these items online. All prices are in Canadian dollars unless listed otherwise. Next PostFall is flying by!